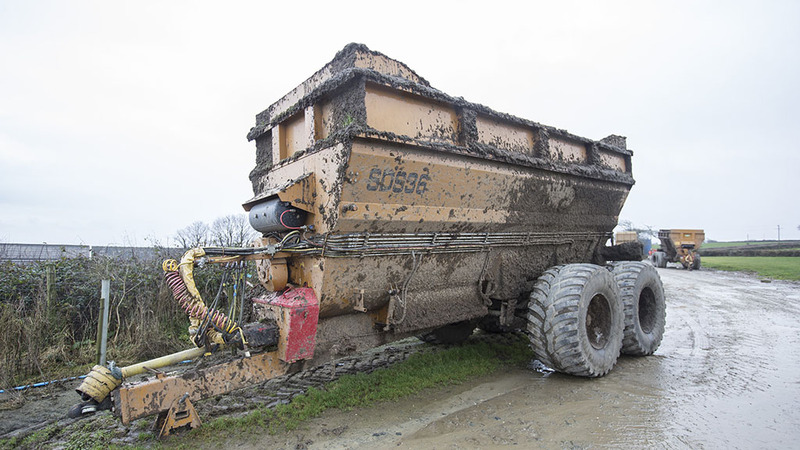 A change to sand bedding to improve cow health has led one Devon dairy unit to put effort into bespoke muck spreaders capable of dealing with the dense waste manure. Geoff Ashcroft reports. The Richard Western SDS36 spreaders offer a payload of up to 20 tonnes. When Willes Farming switched to sand bedding for its cows five years ago, the farm saw a need to review how it handled its manures. The farm has invested heavily in grassland injection systems and nurse tankers to make slurry spreading a low impact, environmentally friendly process. But when it came to lagoons, emptying them meant putting a 360-degree excavator into the hole, and running spreaders in and out to suit. Since the introduction of sand for cow bedding, the process needed a rethink with handling and logistics. “It is a difficult material to spread,” he adds. 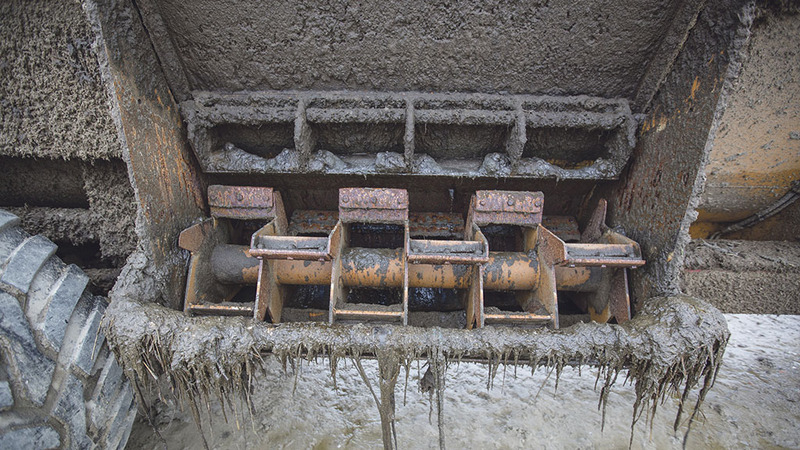 With milking taking place at three different units, the farm overhauled its lagoon facilities, and looked at how it could make solid manure spreading a cleaner, and more efficient process. Importantly, Mr Marsden says the loading shovels gave them the opportunity to make use of them for spreader loading when emptying lagoons. “We could never do it with telehandlers, and this gave us a far better loading option than using a contractor’s excavator,” he explains. “Once we’ve drawn off the liquid, the resulting sand and the fibres it attracts can be dug out with the loaders. They load and carry, to fill spreaders on the edge of each lagoon, instead of having to put the spreaders into the lagoon to load them. Drawing on knowledge from local contractor Andrew Cann, the farm looked at Richard Western spreaders. Pto driven spreading rotor offers a 16m spread width. But what model to choose? Richard Western’s SDS (Side Discharge Spreader) models appeared to offer the solution to carry and spread semi-solid materials. The range uses a central auger equipped with aggressive paddles to feed material to a spreading rotor capable of flinging material over a 16m spread width. And opting for two of the largest capacity SDS36 models, supplied by local dealer Smallridge Bros, meant the farm could utilise its 200hp tractors to boost output. 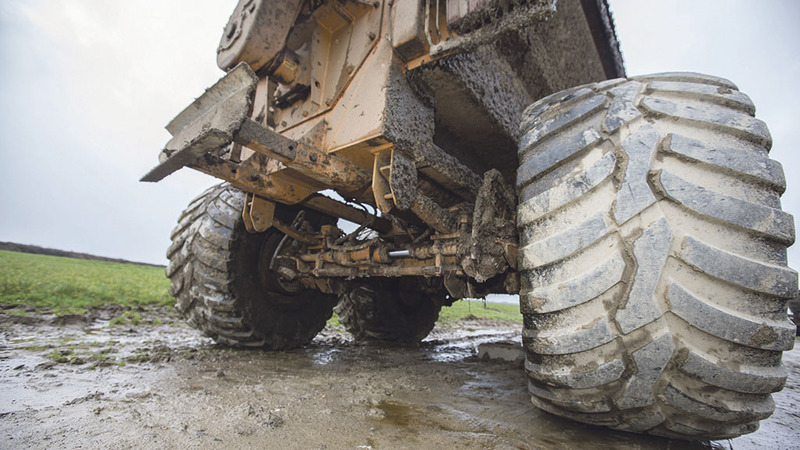 At 5.5m in length with a 2.97m loading height, the twin axle machines boast a 16,363 litre capacity. Given the density of sand, this equates to a payload of about 20 tonnes. Pusher plates can be used to provide a gentle helping hand up slippery lagoon ramps. However, Willes Farming’s SDS36 are not off-the-shelf items. Knowing what the farm was looking to do, Richard Western’s team applied several modifications to the units. First up was the introduction of hydraulic auger drive, so it could be run independently of the pto and spreading rotor. 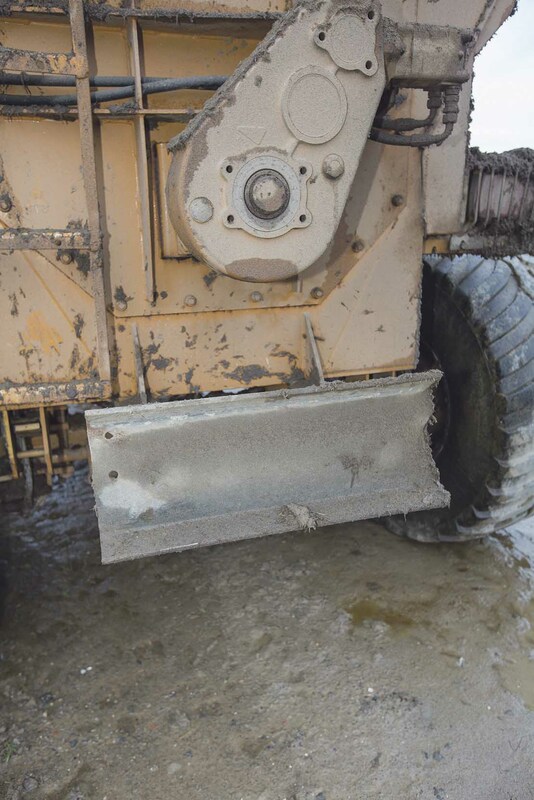 This would give the option to stir the load during transport, to prevent sand compacting and settling in the spreader. The auger is also equipped with a hydraulic motor at both ends, done specifically to reduce the torque loading on the large diameter shaft. Uprated axles were installed too, along with additional strengthening to bolster the SDS’s chassis to accommodate the heavier payload. Internal components have also been strengthened and thickened where required, and at the rear, Western installed pusher plates. This allows the fully-laden spreaders to receive a gentle helping hand from behind should there be issues with traction when climbing a lagoon’s exit ramp. Rear axle is passively steered. Wheel and tyre equipment extends to the largest boots available for this application to combat compaction - 650/55 R26.5 tyres. And the rear axle is passively steered to reduce scuffing on all surfaces, and also to help preserve and extend tyre life. Drawbar couplings are all ball-type hitches for a smoother ride, and the entire outfit runs with air brakes. The all-grass farm has introduced a five-year cycle on grass reseeding. This lets the business carry out all its lagoon emptying through August and September, so the sandy manure is applied to all fields destined to be reseeded. And the plough follows immediately, with the sandy manure buried on the same day. “It is too dense to spread as a feed, simply because it would cap anything that grows,” he says. “But as a soil conditioning material, it is fantastic, and boosts drainage too for our heavy soils.